There are four kinds of electric meter: digital, electronic, smart and dial meters. Here's how to read them. Write down numbers from left to right, ignoring any numbers in red or in a red surround. If your meter has more than one row of figures, write down all the numbers from left to right in each row, ignoring any numbers in red or in a red surround. The previous meter readings on your bill will indicate which is a 'day rate' and which is a 'night rate'. Some electronic meters have a cycle display button that you need to press to take readings; and some automatically scroll through the various displays. 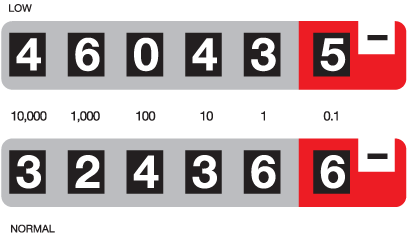 With a meter with two rows of figures, write down all the numbers from left to right in each display, ignoring any numbers in red or in a red surround. The previous readings on your bill will indicate which is a 'day rate' and which is the 'night rate'. Each dial turns in the opposite direction to the one before it. Before you read your dial meter, check the direction of your dials. They may not be exactly as those illustrated above. 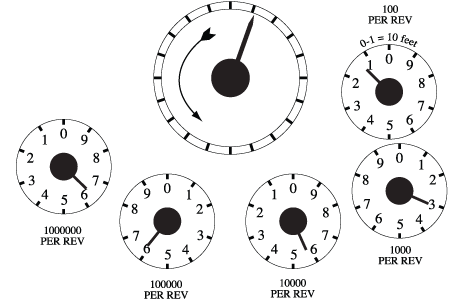 Every dial on every meter revolves from 0 to 1 and through to 9, before continuing to 0 again. In the example above, the dial meter reading shows as 44928. You don't have to read your smart meter, as it automatically sends us your meter readings. View our smart meter guide for more information. Where is my gas meter? It’s not a silly question! You’d be surprised how many people don’t know. If you own your home and there are similar properties nearby, ask a neighbour where their meter is. If you live in rented accommodation, your landlord should be able to tell you where to find the meter. In most properties though, the gas meter will either be in the kitchen, in the hallway or outside in a cupboard or meter box. So in this example, the dial meter reading will be 6653. Each dial turns in the opposite direction to the one before it. Before you read your dial meter, check the direction of your dials. They may not be exactly as those illustrated above. Every dial on every meter revolves from 0 to 1 and on to 9 before continuing to 0 again.